A sleek silhouette is creatively combined with cushioned comfort in the Ansel Chair by Moe’s Home. Offering an inviting worn-in look, the Ansel Chair may say antique with its wonderfully weathered appearance, but its quality contemporary construction of wood, iron, and even fireproof foam displays nothing short of dependable durability. 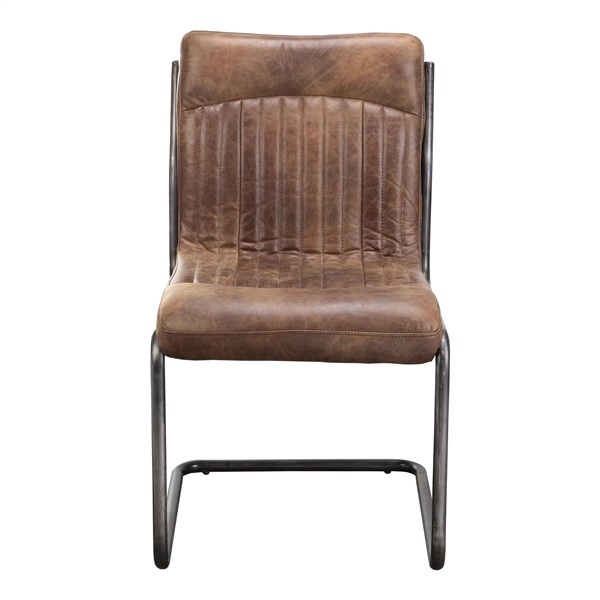 Luxuriously upholstered in top-of-the-line leather in a lush yet neutral brown hue, Moe’s Ansel Chair features that unique and exciting feeling of making a fantastic flea-market find. Inviting upholstery of top-grain leather. Simple yet stable frame of iron and wood. Distressed details for antique appeal.